Mozambique is 8,591 miles away from Honduras. This is Africa, the world’s most ancient home to humanity. The crib of wild and indomitable beasts roaring and hustling through the vast African fields and deserts. This is where the skies watch over the Serengeti, the Ngorongoro Crater, Mount Kilimanjaro, the Nile River, the calm and wondrous Red Sea, the intimidating Sahara Desert, and the Okavango Delta. This is probably what you might imagine when you hear the name Africa. It’s either an earthly paradise or the disturbing image of human faces plagued by poverty, reminiscent of rural communities in Latin America. When facing need and poverty, the term development evokes strategies such as food for all, safe water, useful technologies, innovative enterprises, sustainability, and hopefully a radiant face relishing the emerging quality of life. Let us stop at the radiant face, leaving aside whether the expectations have been met. This is a human face. A human countenance adorned with dreams, hopes, sorrows, joys, and a desire for more –a desire that, although mysteriously insatiable, is distinctly felt. This is a human being eager to establish meaningful relationships with others, hoping to make dreams come true, at least the dream of exploring the limits of their capacities when creatively using their resources to meet basic human needs. It is precisely in this human connection that Zamorano graduates are called to serve to contribute to the resolution of complex global problems. Two Zamorano graduates, Cristobal Aguilar and Maria Herrarte, are an inspiring example of this human connection taking place in Mozambique. Mozambique is located on the southeast coast of Africa. Over 80% of its population depends primarily on agriculture for survival. The economic growth of 7% over the last 10 years has spurred the birth of a new middle class demanding more horticultural production. In Maputo, the capital of Mozambique, demand for lettuce is growing; however, there are constraints in the space available to cultivate vegetables and other crops. Cristobal Aguilar, class of 1994, a Bolivian national, is the country director of the fused nonprofit Agricultural Cooperative Development International and Volunteers in Overseas Cooperative Assistance (ACDI/VOCA), sharing expertise in developing sustainable production systems in Mozambique. 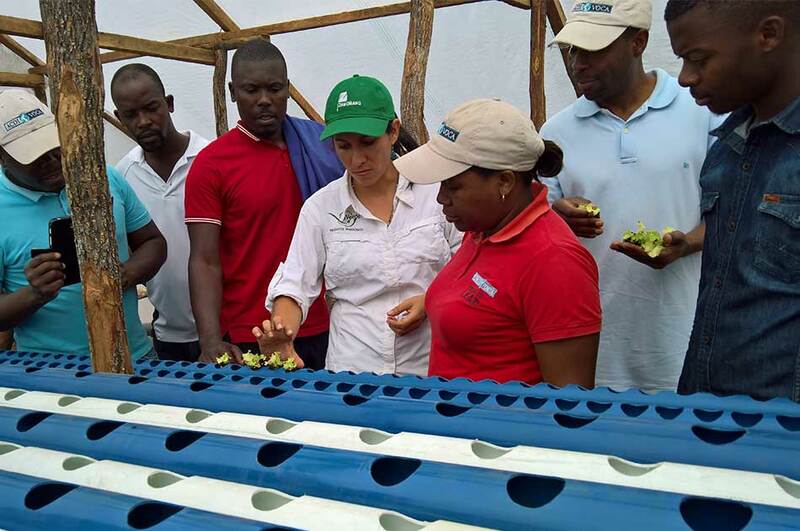 The Livelihood Empowerment and Development (LEAD) project, dedicated to improving living conditions in local agricultural communities, proposed the development of hydroponic production funded by BHP Billiton Sustainable Communities (BSC). 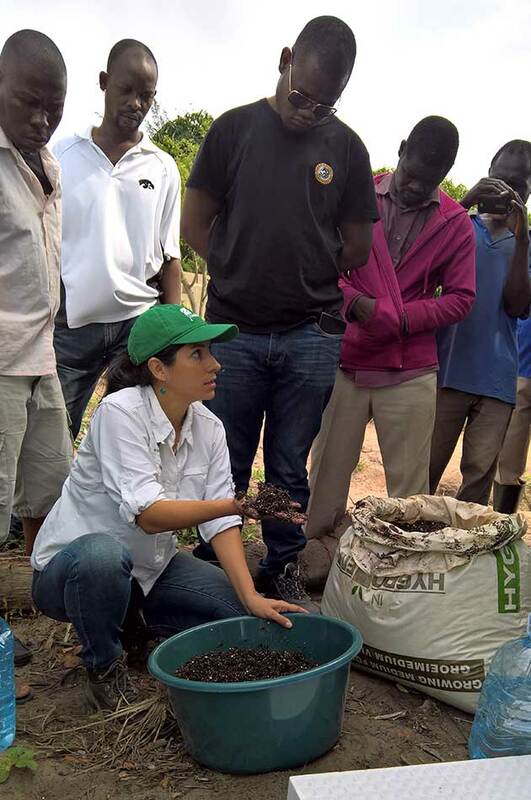 Maria Herrarte, class of 2005, is a young Guatemalan inspired to share her practical and scientific knowledge about agricultural production in Mozambique as an expert volunteer under ACDE/VOCA. 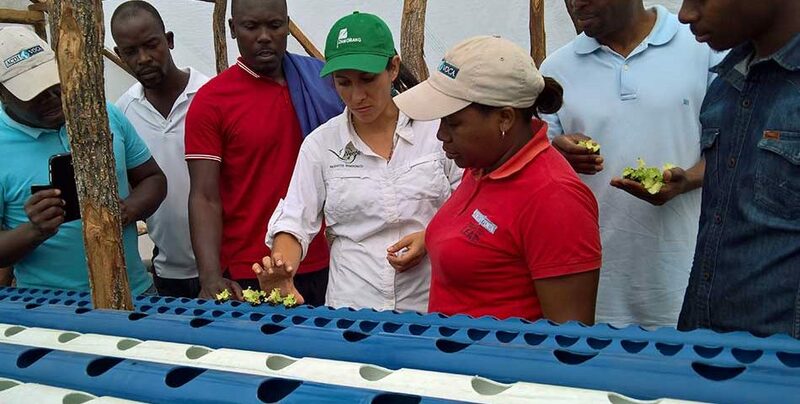 Building connections beyond language barriers, Maria confidently demonstrated her expertise helping to build a hydroponic system using local resources to ensure its sustainability. With this system, there is less water used, higher yields, no chemicals, and a more efficient use of space. Maria showed the locals that anyone can produce plants using this system. In fact, a local group of entrepreneurs has already begun their hydroponic production project. Certainly, listening to what others really need, engaging in meaningful dialogues about what works and what does not, debunking myths, and putting all the hard work into a worthy cause is what Zamorano students are exposed to everyday, along with sharing their cultural diversity. Once they graduate, they are challenged to cultivate hope and inspiration not only through living a life of service and hard work but also through recognizing the complexity of global problems and defying the culture of poverty.